gives the maximum current density that can be extracted between two planar electrodes $latex Delta x$ apart and having potential difference of $latex Delta phi$. To illustrate the concept, I put together a small Matlab program for my propulsion class at the George Washington University. 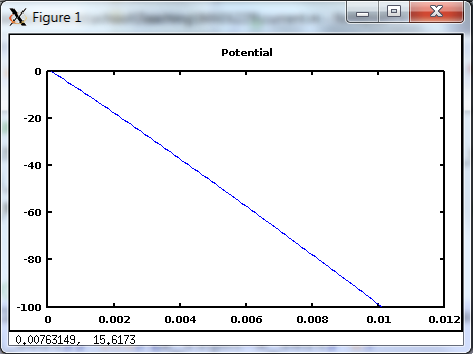 The program (current.m) is given below. It simulates flow of singly-charged Xenon ions, emitted from an anode at x=0, and moving towards a cathode located 1cm away, with potential difference of 100V. 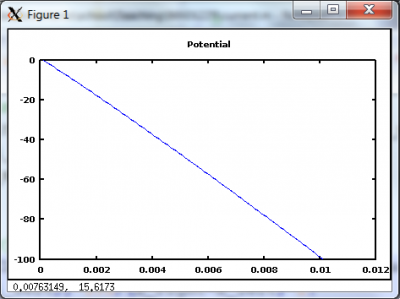 For this configuration, the Child Langmuir law predicts maximum current density of 0.0477 A/m2. den = ion_spwt*count/delta_x;	%divide by "volume"
Figure 1 shows results for this case. 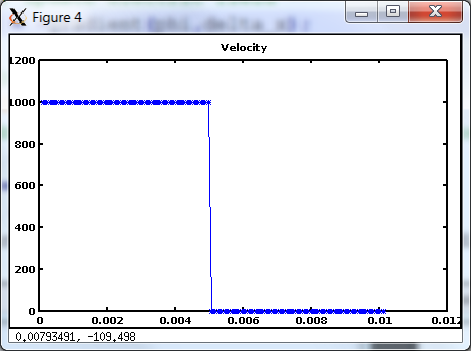 As expected, the velocity remains constant and so does the injection current. 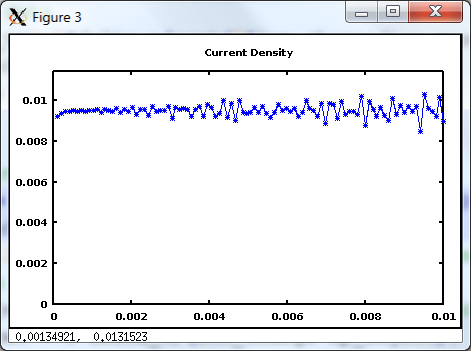 As shown in Figure 2, for this case the current density remains constant at the prescribed value of 0.0095 A/m2. 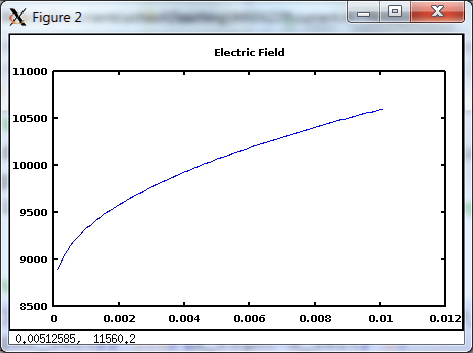 The electric field and potential are also plotted. 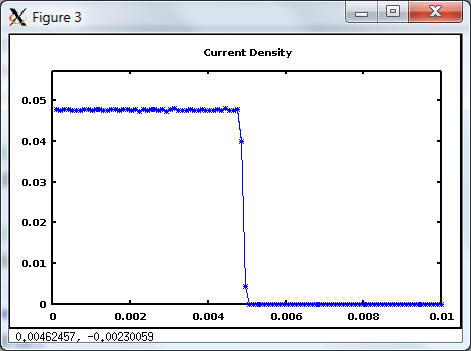 The results get more interesting once the injection current density exceeds the Child Langmuir law. 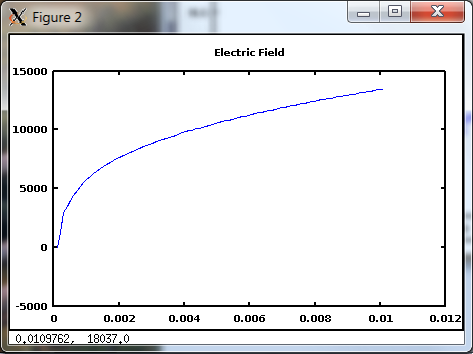 Figure 3 shows these results for injection current of 2 J_CL. Once the discharge becomes space charge saturated, a negative electric field forms at the anode, which then prevents additional ions to enter the simulation. Only as many ions are allowed to pass as is needed to maintain the current density at the Child Langmuir limit. Figure 3. 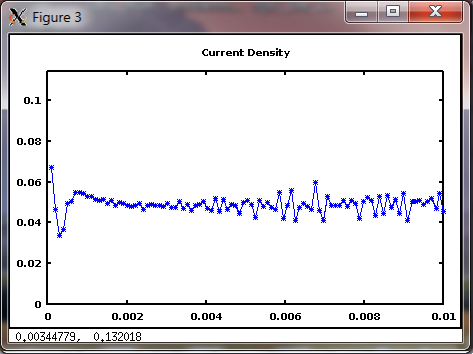 Results with current density set to 2.0 JCL. Once the discharge becomes space charge saturated, a negative electric field forms at the anode to prevent injection of additional ions. 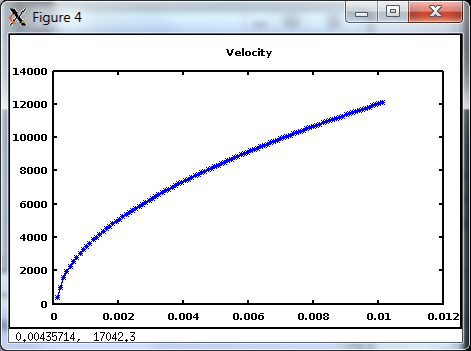 The figure below shows the average velocity. Negative value indicates that the majority of ions are moving in the opposite direction, towards the emitter electrode. Figure 4. 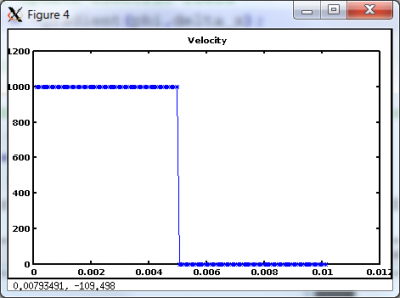 Animation of the dynamic behavior for a space charge saturated discharge.